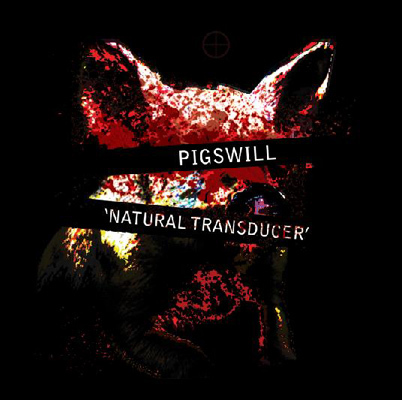 The name “Pigswill” is poetically fitting, in a complimenting way, to the material of this album. “Natural Transducer” gives away the impression of being composed from forgotten chunks of sound that were combined together into a more complete shape. Actually, Nick Andren of Pigswill does a good job in making sense out of these sound bodies, and in his album he creates a powerful journey through different kinds of electronic music and noise, to beats and neo classical moments. This structure (or to be more precise – this assembly into structure) is also fitting for the concept of Andren’s album. In an extravagant attempt, Pigswill is compressing 3.8 billion years of evolution into the 30 minutes of this album, beginning with a primordial soup of abstract sounds, which slowly crystallizes into more recognizable forms. In this illustrative demonstration of evolution, I find it interesting that Pigswill’s music is undergoing a reverse evolution, beginning with more contemporary accepted forms of abstract music and going back into structured music afterwards. This contradiction brings interesting features to this album, and as the sounds change shape, you can almost imagine in fast forward how life assemble and reassemble. “Subterranean”, then, is a droning, seemingly chaotic wash of sounds, which holds many disturbing and hypnotizing moments. “Ghost Breathing” already shows development, yet remains very primitive and raw. I think that this track is the most memorable from the entire album, with the epic explosion of rhythm and sounds that occur four minutes into it. Another great track is “Tower”, which is more aggressive, with a distorted rhythm that reminds of rhythmic industrial from the beginning of this century, along with a melancholic melody that shifts between old EBM moments and old videogames moments, making this track pretty rich with sounds and textures. Whenever I am presented with a summary of a certain timeline, I can’t help but wonder how that timeline looks after the endpoint of its presentation. Pigswill is planning another full album in 2011 so luckily we don’t have to wait for another 3.8 billion years to pass. Sticking to the subject, “Natural Transducer” is a diverse and dynamic album that offers plenty of good moments, with or without a concept idea. Check it out!